One of the best parts of trading is to be able to work according to your own schedule. Frankly, it’s not even work when you love what you do. Yet a “typical” trading day becomes almost boring over time. I say this because your strategy and rules become so ingrained in your subconscious that you simply act the same way in each situation according to your plan. No matter what the market throws at you, you must always be prepared. The market throws curve balls at you every day and you must be ready for them. Come along with me as I take you through my typical trading day. The trading week really begins on Sunday night. No I’m not trading the Globex market open; I’m doing a bit of prep work for the week ahead. Sunday night is a great time to review the news announcements for the week, read through any weekly forecasts, and go through watch lists. 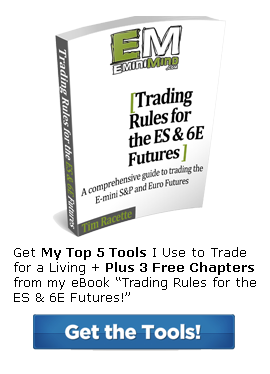 Most of you know that I trade both the Euro open and the NYSE open using the E-mini S&P and the Eurodollar Futures, this means that I must wake up at 2:00 AM. I have adopted a bi-phase sleep schedule to do so. This means that I sleep for 4.5 hours, wake-up, trade the Euro open, then go back to sleep for another 1.5 – 3.0 hours before waking up again to trade the NYSE open and go about my day. There is a lot to be said about sleep cycles, more than I care to delve into right now, but from my research (an actual experience) I’ve found that waking up on a 90-min increment such as 4.5, 6, or 7.5 hours results in the most refreshing and satisfying sleep because you are waking up at a completion of a full cycle. On a typical trading day. The first thing I do when I wake up (after grabbing some juice and toast) is to see what Germany did in the hour leading up to the European open. Typically the European session will do the opposite of what Germany did. I’ve found this holds true on Tuesday, Wednesday, and Thursday mornings (the meat of the week). Monday and Friday are typically less participation days. (I begin Euro open trading on Tuesday morning as Monday is usually uneventful and slow). I call this NYSE open even though the cash session doesn’t open until 8:30. This starts the main part of my day. I usually feel refreshed and away both times I wake up. After taking my resting heart rate I throw on some clothes, grab a yogurt and some orange juice and hit the office. (Oh yeah, forgot to mention that my office is down the hall from my sleeping quarters, a nice feature to say the least). I review what has happened since the Euro open and take a quick glance at Reuter’s news headlines. Then I pull up my daily notes and fill out the day’s numbers. I read over my trading rules (again to engrain them into my subconscious), by now this has just become habit, and the trading beings, (or resumes). (I don’t trade the ES during the first 30-mins because it is erratic as market orders hit the tape). Pandora – to listen to techno while trading (keeps me focused)! This is more of brunch as I will make eggs or some sort of sandwich. I always eat at this time because I found that over the years I almost never had a winning trade on the ES from 10:30-11:00. This is also the Euro close so I like to let things settle out. It’s not worth my time to trade this time frame. If everyone else is at lunch, I should be to. If Euro has been technical all day I continue trading it until 12:30. I also look for a full trading hour’s only halfway back setup on the ES around 11:45-12:30. This is usually the only setup I will take after 10:30 on the ES, else another larger 15-min setup. I stay away from the micro time frames as most of the time this the slowest and choppiest time of the day. The first thing to do is congratulate myself for following my rules, regardless of P/L. 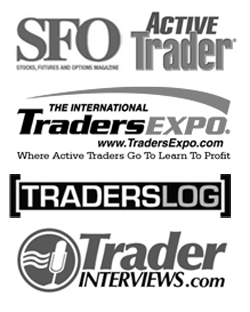 From there I fill out my trading journal and review all my trades from the day. I rarely trade past 12:30, only if it is a super technical market on the ES in which case I will trade until 2:15 as the last hour again becomes choppy and erratic. I am constantly reviewing my rules and trade setups. Between now and 2:00 I work on other projects or tasks that I need to take care of, sometimes it’s running to the post office or bike shop, watching some YouTube videos, or catching up on some podcasts or an audio book. I race mountain bikes so 2:00 is my time to ride and train. I’m usually on the bike for 2-3 hours T-TH. This not only acts as a huge health benefit, it breaks up my day and allows me to regroup and reset my systems. Plus I’ve come up with some of my best ideas while on the bike! Making a delicious dinner is one of my favorite parts of the day. I’ll usually fire up the grill and put on some chicken, or steaks, or throw some sausage and peppers in the oven (among other sides). Now is the time of day where I review the broader market data. I upload my trades directly into StockTickr with the bulk upload tool which saves me a lot of time. I then review ALL the setups for the day and see if there is anything I missed or trades that I took that weren’t valid. If I find that I took all the valid setups for the day it’s been a great day. Once and a while I will miss a setup or over look something that invalidates a trade, but with taking 6-12 trades a day and specific time frames to be looking for setups that doesn’t happen much. or the day. This is time I use for working on projects or chatting with traders. Wednesdays I meet with a mastermind group with some local small business owners to discuss our businesses and work to expand them. During the summer this time is filled with sports leagues and some group rides on the bike. I try to get in bed by 8:30 and read some Forbes magazine or a good book so that I can fall asleep by 9:15. Getting to bed by this time, again, lets me get in three full sleep cycles (4.5 hours) before doing it all over again. I use this exact schedule 3x a week Tues-Thurs. Monday I wake up at 6:45 AM skipping the Euro open session, and Friday I’m done trading at 10:30 and will hit the golf course (in the summer) and gym instead of riding the bike. Friday night it’s time to meet friends for dinner and drinks. My weekend is then filled with riding, races, trips, and other fun activities. I spend a lot of my time away from trading listening to audio books, talking to other business owners (both trading and other disciplines), and riding my bike. It makes for a great balance and is a lifestyle I love! If you have a routine, schedule, or I’d love to hear it. Share your trading story in the comments section below. Awesome Verde, ya it didn’t take long to get used to the two phase sleep schedule as long as your disciplined to get to bed on time. I’m actually headed out to AZ at the end of this week to do some riding. Futures rollover makes for a good travel day. Hey Tim its nice to see how other traders get prepped for the trading day especially since im still learning. I just recently got myself into a routine and dont understand why i didn’t do it sooner.My routine is a lot different because i have a full time job that has nothing at all to do with trading. I think it could be helpful for other people in my position to here my routine. 2. I turn on my computer and load all my programs i will need for the day. 4. In it i look at the daily chart and market profile to get an idea of where we are at on the higher time frame. And i will see what figures are out for the day etc. 6. If all goes well i have my levels ready everything running, and an idea of where i want to trade for the day. I will stay away from the first 30 mins my self most of the time unless i see something solid set up. I try and trade my plan for the day the best i could without altering it to much. but being new to trading im still struggling with it. I will go to lunch for an hour then back at 1pm to see what has happened. a Lot of the time i am limited to trading because of work but i can find time here and there to see what has happened. It is not easy at all workig and traing at the same time and im starting to think that im not going to be able to be profitable unless i didnt work full time any more . But im just not ready to make that commitment. That’s great Mike. A routine definitely adds stability to the chaos of the markets. One of my trading friends always says, “if you wanna be there for the good times, you gotta be there all the time,” however, it really is just a matter of experience. Taking one or even no trades in the morning session before work can be very effective. I used to use a simple swing trading strategy to trade stocks where I would set all my orders outside market hours because I at class and work during the open and it worked out very well. I’ve been capturing some of my trades and putting them up on YouTube over at the EminiMind channel. I’m trying to figure out the best way to share my methodology. In the simplest form I use a halfway back method drawing Fibonacci lines and entering at the 50% and looking at the tick. The problem is there are a lot of things going on subconsciously that I don’t even realize. I have my rules and trading plan written out so I will try to post it or arrange it in a way that is easily understandable, and more importantly useable for you guys. You’re welcome Bob, great article. There have been studies showing 6 hours of consecutive sleep is best to help your body recover, so on days when I train hard I usually do a 6-hr block and then a 1.5-hr block. Otherwsie I usually day 4.5 and then a 1.5 or 3. Really it all depends on how your body responds to the change. It didn’t take long to get used to the routine. Plus it helps to eat decent meals. Everything in moderation is my view. Glad to have you in the community! JP, 6:45am CST would be “pre-market” in my eyes and I DO look to initiate trades on the ES during this time. I don’t trade exactly the same way DH does, but similar. If a gap fill setup is presenting itself at the European Open I will look to enter it there, otherwise I will try during the pre-market session, not trading the ES during the first 30-mins that the cash session is open and then trading until about 12:30 CST, I don’t bother with the afternoon session. That’s awesome. I like the commitment. Exactly Steve. If you want to be there for the good times, you have to be there all the time. There’s no short cuts when it comes to trading. Great stuff for sure. Stick to the routine, be patient, wait like a hawk and become part of that alleged ‘10%’ that takes money out of the market routinely. People like to argue with me that more than a fraction of traders actually make money in the markets, but when you look at how many people call themselves traders, let’s just say 100,000 to make for simple math. If 1% or 1,000 people made money consistently, that’s actually quite a big number. You hit the nail on the head talking about patience and sticking to the plan. By following a steady routine you’ve essentially created a framework for the chaos which is the market. You have a excellent, organized, daily plan of attack. So simple in many aspects yet so hard to follow in a hectic trading day. Having a plan in place like this is so important and you have given me a kick in the pants to get that plan set in stone. Very true. Sometimes the simplest things to do become easy to not do. I find creating that structure around the chaos which is the market really keeps me in the ‘zone’ and in tune with the markets. Wonderful, thats a brilliant way to divide time, and make the best use of trading slots. i also appreciate the discipline that you observe all across the week. This is so important to maintain to be focused in your strategy. With a schedule like that, you deserve to succeed. Hi Tim, I was curious to know if you still follow this routine since it is now a couple years later. if you don’t what has changed? and why? Hi Matt, I don’t wake up for the European open anymore. It got to be too hard with racing in the summer months. For the most part though my routine stays about the same beginning the night before reviewing the markets in the evening, going through my watch lists, checking the economic and news calendars. The main thing is to try and keep things as simple as possible so you can develop good habits that are easy to follow. I’ve just stumbled upon your blog after googling Mark Douglas’s “Principles for Consistency”. What resources do you use to see what Germany has been up to prior to the EUR open? For news, I’ve found that forexfactory can miss the odd bit here and there, I cross-check it with the calendar at fxstreet, which I’ve found to be a bit more detailed. Aside from Reuters, Forex Factory, and the EconoDay Calendar I don’t delve too much into the news. It may sound counter-intuitive, but I try to just identify patterns of behavior (as a result of what’s going on in the broader market and mass sentiment) that I’ve seen in the past to determine various scenarios in the future. I think of it like a chess game. FXStreet has some great stuff.